Police in Montgomery County, Texas, are searching for an apparently shackled woman. 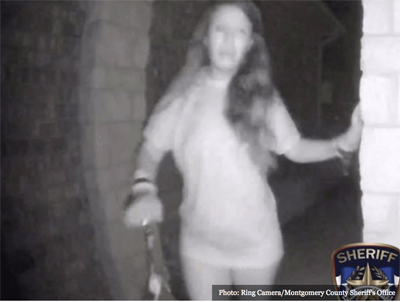 A doorbell camera captured an image of the subject ringing a bell at 3 a.m. on Friday. 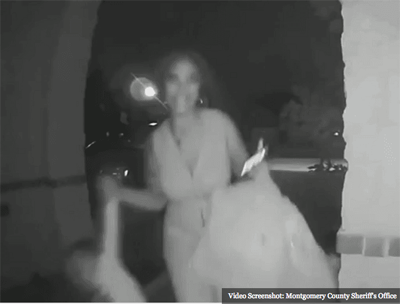 Officials with the Montgomery County Sheriff’s Office near Houston said neighbors in the Sunrise Ranch subdivision of Lake Conroe reported a woman going from door to door, ringing doorbells at about 3 a.m. on Friday. One of the homes had a Ring Doorbell camera installed which captured a video showing a barefoot, scantily clad woman. Her right wrist appears to have some type of handcuff restraint attached. Her left hand appears to feature a broken restraint. Montgomery County Sheriff’s Office Lt. Scott Spencer asked anyone who might recognize the woman to call their office with information. Callers are asked to reference case# 18A243347. 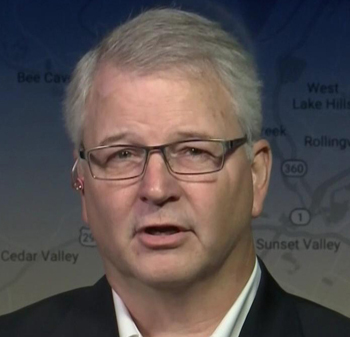 Spencer said his office has received numerous missing person flyers after the video began circulating on social media. Police say that none of the leads have been tied to the woman at this time. Lt. Spencer also said there are no women reported missing in the area. Investigators are conducting door-to-door checks and are searching for any other video surveillance in the area where the incident took place. One neighbor told KPRC NBC2 reporters that her husband answered the door after hearing the ring, but no one was there by the time he arrived. Another resident said they heard an “unsettling knock” at 3 a.m. on Friday. “She looked like she had wrist restraints on her wrist and she was barefoot. You can see her with a worry on her face looking around,” the homeowner stated. “Unfortunately, times have changed from yesterday so you have to be very careful we have had a lot of home invasions,” the sheriff’s office lieutenant said. 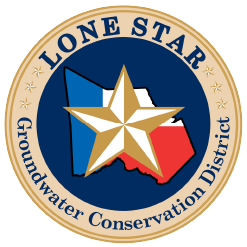 The Lake Conroe area is located about a half-hour north of Houston, Texas.